Our Mekong Flooded Forest Outreach Team went to 20 Green Schools (both primary and secondary) in Kratie and Stung Treng Provinces. They provided the students materials in collaboration with each schools’ respective School Directors and Green School teacher clubs. 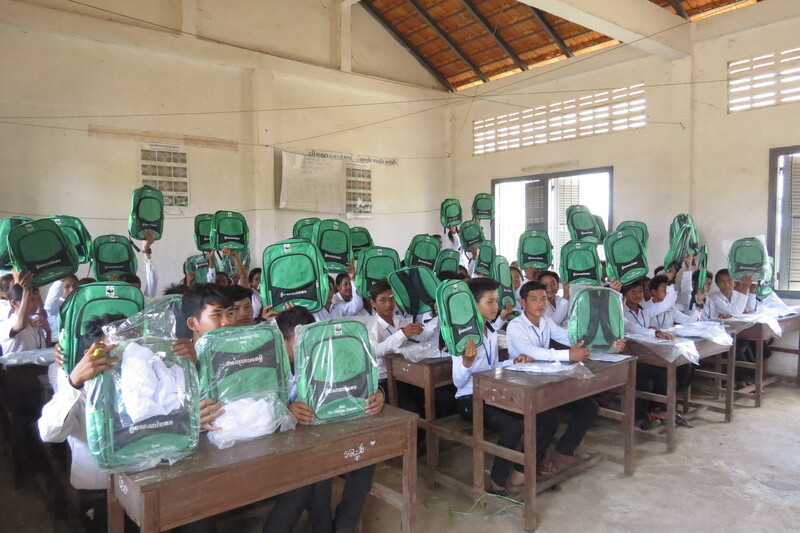 In total, 1200 students received Green-School labelled rucksacks and t-shirts with a dolphin conservation message printed on them. WWF Cambodia established the Green Schools programme in the MFF in March last year, in cooperation with the Ministry of Education, and Youth and Sport. It was established in order to promote environmentally friendly schools where the students are made aware of issues like ecosystem and natural resource management, conservation and climate change through regular capacity building (both students and teachers) as well as field trips and study visits. Students are also trained in leadership skills, and project and budget management. We’re hoping this helps them in being active and significant figures in environmental conservation in the future! Students in grades 4-6 are eligible to participate, and the aim is for them to then spread the conservation message to the wider community through campaigns and events, and the good old-fashioned word-of-mouth. Campaigns and events are usually correlated with days that are significant for conservation purposes or national conservation awareness events such as the Dolphin Day. We also conduct annual competitions between Green Schools to award the most eco -friendly one. Currently we have 20 eco-friendly schools, equally distributed between Kratie and Stung Treng. The schools were opened as an Outreach tool in order to support WWF’s ongoing Bird Nest Protection and Dolphin Conservation project. The Green School project is currently still in its three-year pilot phase. At this given instant we can’t estimate the length of the project. It’ll be based on Dolphin and Bird Nest projects that it supports. As the project nears it first year mark, we have reviewed the training conducted for both: teachers and students, via campaigns. We’re in the process of developing exchange programs and competitions. As Green School activities are only conducted during term time, and the project is still in an early stage, it is not yet possible to determine whether there have been benefits in the form of raised awareness in the Green Schools, in the students’ home villages or in the community where the schools are located. Therefore, an evaluation and survey will take place in three years’ time, at the end of the pilot phase. If the Green School project is successful following evaluation, which we are confident that it will be, the plan is to eventually open or convert more schools in each province into Green Schools. The Green Schools programme in the MFF is established in order to promote environmentally friendly schools where the students are made aware of issues like ecosystem and natural resource management, conservation and climate change. 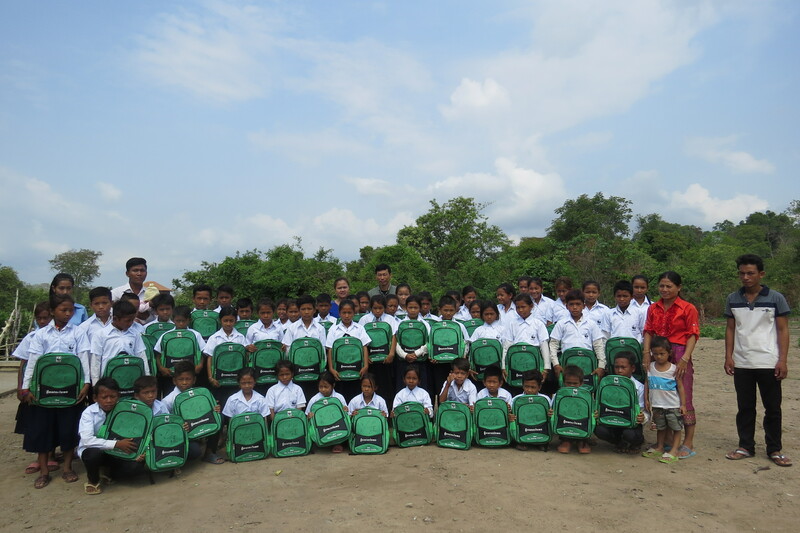 1200 students received Green-School labelled rucksacks and t-shirts with a dolphin conservation message printed on them.